A few month ago we purchased a HP ML 115 G5 servers to use as a ADC with Windows 2008: hereafter I will give you my impressions and some tips to operate with this equipment. According to my impression the model in question can be placed it on the cheap-but-not-too-much, but I was impressed by good perfomance: in short, a good solution if you do not want to spend too much, and you want to use in an environment of up to twenty people. In addition with the server we have been purchased RAM expansion and another HD, in order to create a RAID 1 Mirror: in fact the mother board is equipped with an integrated SATA RAID controller. The installation of additional hardware pieces was done without any problems (except of course for the small detail that the screws to mount the hd is not provided …..). Just a note: the SATA connector 1 is delegated to keep the main HD (if you do not use RAID). The other SATA connectors (up to 4) must be used to connect additional HD to be used for RAID: on the other end SATA connectors 5 and 6 are used to connect SATA devices out of RAID (CDROM, etc). We have connected the SATA HD on SATA connector 3, leaving the one already installed on SATA connector 1. To activate the RAID you have to access to the BIOS, using F10 at boot, and then select Advanced Configuration and next HDD. At the next boot, it is possible to get in the RAID configuration utility by using F8 at boot, and here is possible to establish the RAID1/mirror. After this action we was able to install the operating system without any problem: unlike other models of HP server, with this device we didn’t have any problems about driver. We have used the geometry of the disk like the following: the uses of the server will be ADC + DNS + DHCP + File Server, and the server side of an accounting management software using Sql Server. 1 partition with the remaining space for the shared data. After the installation of O.S. we noticed an unpleasant problems: in fact, the fans continued to spin at maximum speed, making a deafening noise. Normally at boot the fans run at maximum speeed, and after some seconds the speed decrease down to a reasonable speed: in this case, instead, rather than decrease the speed increases ! HP assistance, contacted for clarification, advised us to put an earlier version of the BIOS: after several attempts of update with old and new version of the BIOS we were unable to solve the problem. Waiting for HP to give me a solution, looking in the BIOS, APM section, I found the following items. I tried to act on these, but nothing ! A quick google-search allowed me to make sure that what changes in these parameters is the speed of the CPU (when it is idle or too hot) and not the fans. I finally came across in a forum where an anonymous advised to submit the firmware-upgrade for the card Lights-Out, though the server in question is not equipped with this device. Amazing … after this upgrade the server begun to work properly! The fans, after a few seconds from power, become silent! Just a note: Lights-Out (also known as HP Integrated Lights-Out iLO, for friends) is a system that allows remotely to connect to the console of the HP systems, including the BIOS. Once I resolved the situation for safety applied to the server to the latest version of the update ROM BIOS, downloaded from the HP support site. Here, too, must open a parenthesis: to upgrade the BIOS on the site are two possibilities (both have the same result). The first system allows you to create a bootable USB stick to be placed inside the server: the system starting to use this device and will be automatically upgraded to take a few minutes. The second system, however, is a simple software that have to be launched from windows that takes care of doing the same thing, but I wanted to point out that if you decide to use this method will use the software in question over an hour to do this, and while the update is in place the server becomes so slow as to be almost unusable! 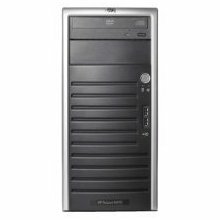 While we’re here I recommend to also install the HP ProLiant 100 Series Servers Null Management INF Installer Smart Component for Microsoft Windows Server 2003/2008, which as I understand it only serves to remove the device that is not recognized in the hardware options of the system. This entry was posted in Hardware and tagged Hp by Giampaolo Tucci. Bookmark the permalink.